Rocky Curtiss '61 passes along news of the passing of Bill Stulla at age 97. 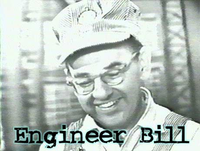 As Engineer Bill, Stulla's 1950s TV show kept LA children drinking their milk for over a decade and earned him two Emmy awards. For the "mourners" and those too young to recall, the LA Times obituary is linked below. I won a Spud Gun playing the Big Whistle at the grand opening of the A&P Market (Las Tunas & Baldwin). Whoooo-whoooo. The train has left the station.